Objective: The objective of this study was to analyze microbial quality of raw milk and some milk products from Nanded region and to determine their antibiotic susceptibility pattern. Method: A total of 80 samples was collected and screened for the presence of some bacterial pathogens. These bacterial pathogens were identified based on morphological characters and biochemical tests and were further subjected for antibiotic susceptibility tests. 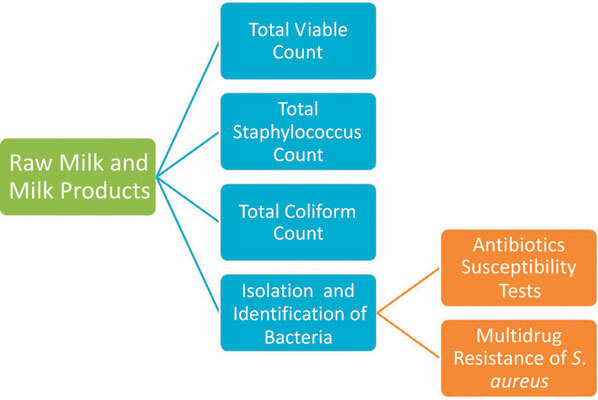 Results: Among all the samples, the raw milk samples showed the highest total viable count, total coliform count and the total Staphylococcus count. The highest contamination in curd was found to be with S. aureus (40%) followed by S. epidermis (10%), E. coli (10%) and P. aeruginosa (03%). The paneer samples were found to be contaminated with E. coli (90%) followed by S. aureus (50%), S. epidermis (50%), P. aeruginosa (50%), Micrococcus sp. (25%) and Shigella sp. (10%). Similarly, peda samples were found to be contaminated with S. aureus (95%), E. coli (75%), P. aeruginosa (60%), S. epidermis (50%) and Shigella sp. (25%). All the raw milk samples were found to be contaminated with S. aureus (100%) followed by E. coli (90%), P. aeruginosa (80%), S. epidermis (50%) and Shigella sp. (20%). The antibiotic study suggests that out of 92 isolates, the highest resistance was found for penicillin (38.04%) as compared to other antibiotics. Similarly, the multidrug antibiotic resistance pattern (MAR) was detected in 36% (9/25) of S. aureus. Conclusion: The finding of this study revealed that the consumption of raw milk and traditional milk product may be a potential risk for foodborne infection in this region. Antimicrobial resistance, E. coli, microbial quality, milk, S. aureus, foodborne infection.